← AUDIOBOOKS: THE CHINESE FOOD OF LITERATURE? A good novel can keep readers turning the pages as they try to guess what will happen. 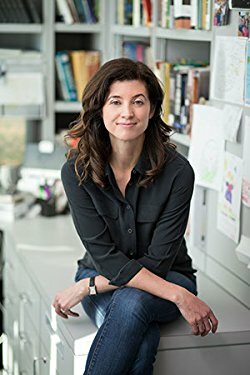 Nonfiction writers have the challenge of keeping readers interested even if they know what will happen. 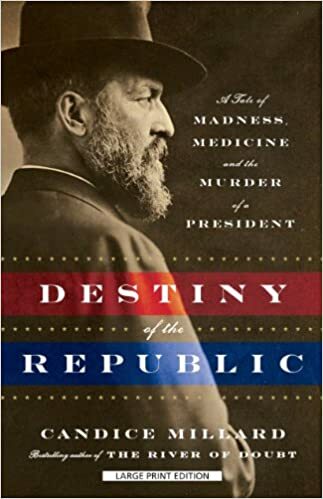 Candice Millard succeeds beautifully in Destiny of the Republic: A Tale of Madness, Medicine and the Murder of a President, a page-turner about a president most Americans never think of, James A. Garfield. With her skillful storytelling, she brings the long-forgotten president to life and shows him to be a man of courage, brilliance, modesty, integrity, and goodness. Garfield, the twentieth U.S. president, was shot just four months after his inauguration and died eleven weeks later. His short tenure robbed him of any chance at achievements and renown. The nation mourned him, but they didn’t know him yet. And I’d venture to say, until Millard’s book, Garfield has remained little more than a footnote. The youngest child in a family of four, Garfield grew up in abject poverty in Ohio. After his father’s death when he was one, his mother, Eliza, sold much of the farm to pay the family’s debts, and together with her eldest son, eleven-year-old Thomas, she worked the land to keep the family together. Determined that James be educated, she donated some of her land for a schoolhouse. Her faith in him was well placed. When he was sixteen, Garfield enrolled in a preparatory school, where he worked as a janitor in exchange for classes. He began to realize that he had talents and resolved himself “to make a mark in the world. … There is some of the slumbering thunder in my soul and it shall come out.” Come out it did. By his second year, the school had promoted him from janitor to assistant professor, teaching literature, mathematics, ancient languages, penmanship, and Virgil. After graduation, he attended Williams College and then returned to his preparatory school, becoming its president when he was twenty-six. In 1859 an Ohio state senator died, and Garfield was asked to run for his seat. “I am aware that I launch out upon a fickle current,” he wrote. The Civil War interrupted his political career but gave him another chance to excel. At the Battle of Middle Creek in Kentucky, Garfield ordered his troops to attack from three sides, hoping to fool the Confederacy into thinking the regiment was better manned and armed than it was. Garfield succeeded but the carnage devastated him. The party was hopelessly deadlocked among three candidates. Slowly delegates began to turn toward Garfield, prompting him to stand to protest the votes. “No man has a right, without the consent of the person voted for, to announce that person’s name and vote for him, in this convention. Such consent I have not given….” It didn’t matter. On the thirty-sixth ballot, Garfield became the nominee of the Republican party and went on to win a close election. Millard contrasts Garfield’s trajectory with that of the confused and delusional man who would take his life. Charles Guiteau believed himself to be chosen by God for greatness, but showed no facility for achievement. He left unpaid bills wherever he went and flitted from one pursuit to another. For a time he lived in a utopian religious community, where he was so disliked that women nicknamed him Charles Gitout. He also tried and failed in work as a theologian and a lawyer. Never discouraged, he always expected to reach the top. When his attempts to get a political appointment failed, Guiteau procured a gun and followed the president to determine the best time and place to shoot him, eventually choosing the Baltimore and Potomac Railroad Station on July 2, 1881. Garfield’s wound was not fatal, but the medical care he received was. Without using any form of sterilization, doctors probed inside his body for the bullet. The U.S. medical community was dismissive of Joseph Lister’s life-saving discoveries about sanitation, leaving Garfield to suffer in silence as his infection spread. His doctors understood his fever and vomiting as signs that his body was healing. The incompetence makes for fascinating and harrowing reading. A good nonfiction book can do everything a novel can do, including entertain through strong characters and good pacing. In Millard’s hands, Guiteau is a horrifying murderer, the medical profession is cruelly old-fashioned, and Garfield is a noble man who had the potential for being a great president. Janet Willen is author of Speak a Word for Freedom: Women against Slavery (2015) and Five Thousand Years of Slavery (2011), written with Marjorie Gann and published by Tundra Books. Publishers Weekly called Speak a Word for Freedom an “engrossing study of female abolitionists from the 18th century to the present day” and gave the book a starred review. Five Thousand Years of Slavery was named a 2012 Notable Book for a Global Society by the International Reading Association and a Silver Winner in young adult nonfiction of ForeWord Reviews, and it received a starred review from School Library Journal. A writer and editor for more than thirty years, Janet has written many magazine articles and has edited books for elementary school children as well as academic texts and a remedial writing curriculum for postsecondary students. Janet lives in Silver Spring, Maryland.